Opened in September 1975 shortly after the end of the Vietnam War, the War Remnants Museum is a popular attraction in Ho Chi Minh City – a significant stop for travelers looking to hear the Vietnamese response to the war in their country. The atmosphere inside of the newly-renovated museum is hushed and somber: graphic displays, photographs, unexploded ordinance, and other artifacts show the horrors faced by both sides. The airy, three-floor museum houses around seven permanent exhibits with captions in both Vietnamese and English. The spacious yard outside the War Remnants Museum houses American tanks, bombs, and aircraft, as well as a mock-up of a POW prison. For related exhibits, see our list of other Vietnam War sites of interest, or our list of creepy museums in Southeast Asia. The War Remnants Museum was known as the Museum of American War Crimes until 1993; the original name is perhaps more fitting. Many exhibits in the museum contain a heavy dose of anti-American propaganda. Even simple displays of U.S. weapons used during the Vietnam War are displayed against backdrops of displaced villagers and civilian victims. Exhibits not openly portraying anti-American sentiment tend to showcase the overwhelming U.S. firepower used against the Vietnamese during their "Resistance War". Historical Truths: A room containing photographs, propaganda, news clippings, and signboards geared toward showing the wrongdoings of the U.S. government in the 1960s and 1970s. One display reproachfully quotes the U.S. Constitution, a passive-aggressive jab at how far America fell beneath its principles when it got involved in Vietnam. Requiem: A powerful collection of 330 photographs taken by 134 international journalists who worked throughout the Vietnam War. Curated by Vietnam War photographer Tim Page and former Associated Press bureau chief Horst Faas, the collection shows the horrors of war as seen by both Viet Cong photographers and their Western counterparts. Vestiges of War Crimes: Another room heavily dosed with propaganda showing the mistreatment of civilians during the war. This room is not for the faint of heart, as it includes graphic photographs of torture and mistreatment of corpses; preserved specimens of malformed fetuses, the effects of Agent Orange defoliant sprayed by American planes; and other effects of the Vietnam War on civilians, highlighted by the award-winning photo of a 1972 napalm attack. If you want a piece of the museum to take home with you, stop by the souvenir shop for books, postcards, and memorabilia recycled from war materiel, including keyrings made from ancient bullet casings. Along with the inside displays, many restored pieces of American military hardware are parked around the grounds of the War Remnants Museum. On the museum’s front courtyard, preceding the entrance, you’ll see captured American armored vehicles, Self-propelled artillery, and ground artillery pieces. Behind the museum (visible from the upper floors) are aircraft like fighter planes and helicopters, including a massive Chinook chopper. The “Huey” UH-1H on the grounds played a role in an action that earned Army Medic Guy LaPointe a posthumous Medal of Honor. Right next to the building you’ll also find defused bombs, missiles and other ordnance left over from the Americans. As you exit the museum, don't miss the mock POW prison on the museum grounds. Signboards and graphic photographs portray various ways that prisoners were mistreated - primarily before the U.S, became involved in Vietnam. Tiger cages – tiny enclosures used to torture prisoners – are on display as well as an actual guillotine used for executions until 1960. Although the exhibits are blatantly one-sided and need to be taken with a grain of salt, they do graphically portray the horrors of war. The War Remnants Museum is worth a visit no matter your opinion on U.S. involvement in Vietnam. 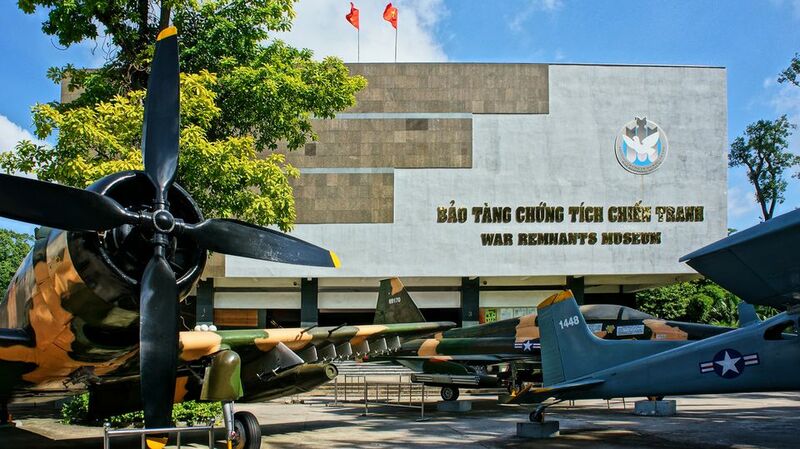 The War Remnants Museum is located in Ho Chi Minh City - formerly known as Saigon - in District 3 at the corner of Vo Van Tan and Le Quoy Don, just northwest of the Reunification Palace. A taxi from the tourist district near Pham Ngu Lao should cost under $2. Open Hours: 7:30am to 5pm daily; the ticketing window closes from 11:45am to 1:30 pm. The last admission to the museum is at 4:30 p.m. When to Visit: The War Remnants Museum gets busy in late afternoon as tours to the Cu Chi Tunnels finish there. Avoid the crowds by going earlier in the day.